It's been a long time since I had an early-morning Saturday blog, but I fear my platelet donation days may be behind me. (Not that it affects you - what are you waiting for?) Now being a Cancer Survivor, this is kinda close to home. Although I never needed any, when I donated, the bulk of my product went right up to Dana Farber hospital and the Jimmy Fund for transfusions to cancer patients - among other things, chemo wipes out your platelets. But I digress. This morning, we're heading out for Nobscot Scout Reservation in nearby Sudbury, MA. 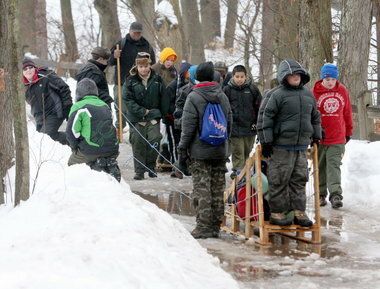 It's the annual District Klondike Derby. This is an annual scout skills competition among the troops. The boys load up what is essentially a dogsled and drag it through the woods to the various stations. Fortunately, we have a skim of snow and it should be cold enough today that it will keep. It makes things much easier. I'm sure many of us were out and about during the current arctic blast. But were you warm enough? Over my scouting career, one of the things I like best is camping in the winter. I've become good enough at this that I actually teach people how to do this professionally. (Through the Outdoor Discovery School at the store.) I don't really know what the allure is...other than the achievement of "beating nature". It's going to be cold enough this weekend that hypothermia and frostbite are a real possibility...but of course, I've got all the gear. I was trying to remember my first winter trip so I could tell Javi the tale, but curiously it's not a strong memory of mine. I certainly remember the 35 below zero trip, the 40 below wind chill trip, and the troop's first, second, third, and fourth blizzard trips. (You'd think we'd learn.) Even the April assault on Mt. Monadnock in a blowing snowstorm. Ah, but these are the things you remember. We humans are basically a tropical species. Just look at us, we're the only primate and one of the few mammals that don't have significant external body hair. As a result, we have very little natural insulation, so being outside of the tropical zone where our ancestors frolicked is actually not natural for us.